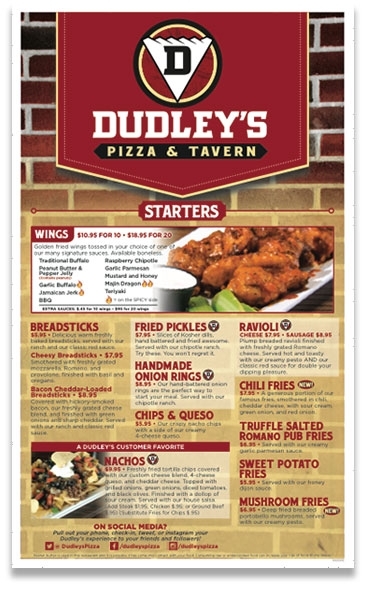 Dudley's Pizza & Tavern features a variety of menu items including appetizers, pizzas, steak burgers, sandwiches, wraps, soups, salads, desserts and a Kids Menu. We also offer a full-service bar with daily happy hour and "reverse" happy hour specials. Click on any of the "ORDER ONLINE" and "ORDER NOW" buttons you see in the site to view a full menu and place your order. To View Our "LUNCH SPECIALS," Visit Our "Specials" page here.